The MPTool program is designed to work with Canon MP-Series. 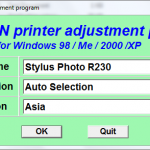 This software works well on following canon printer models: MP150, MP160, MP170, MP180, MP450, MP460. It is possible MPTool software is now is the only software resetter for canon Pixma MP in the world. MPTool program also called Canon MP service program, this program is free for personal use and the software is easy to use and no installation is required. MPtool software is portable software so you can run the software from external hard disk, flash drive or from your computer. Showing information the ink level of cartridge and ink counter of the printer. Read, record and reset the printer’s EEPROM. Resetting ink level counters on black and color cartridges and also can reset waste ink counter on the printer. BK – Ink level for black cartridge. CY – Ink level for Cyan cartridge. MG – Ink level for Magenta cartridge. YL – Ink level for Yellow cartridge. Port Name – displays the port where the printer installed. 1. Subsection Reset Counter – Ink Counter. Reset Black – Reset ink level on the black cartridge. Reset Color – Reset Ink level on all color cartridges. 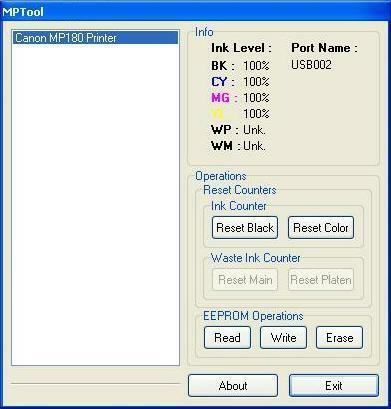 Reset Main – Reset waste ink counter on the Canon MP printer. Reset Platen – Additional reset waste ink counter on the Canon MP printer. Read – reading EEPROM *. bin in the printer file. Write – Record *. bin file in EEPROM printer. Erase – zeroing EEPROM printer. Related to "MPTool Software Resetter for Canon MP150, MP160, MP170, MP180, MP450, MP460"
Will there be a version for pixma mp190? this one does not recognise that printer. Can we have one for the MP190 please. Not the MPC190. Why can’t someone post a fix for the MP190? do you have this kind of software for mp510?? list index out of bounds ? why wont it work ? Not work for MP 190. !! why does it hang on my computer? Why does it hang at my computer and not finish resding ? @Juri, to prevent your problem before using this software you must manually reset on your printer. This proggy is cool! But i can see my printer on the list?? Why?? @Dr Feelgood, There are two possibilities, this program does not support your printer or any error on your printer/windows installation. WARNING!!! I tried using MPtool on my MP170. I misread the instructions initially and now my printer is toast!!! I did everything as specified up to getting the printer in low level mode. Then I unplugged it (wrong step) plugged it back in, turned it on, and then ran mptool. Now my printer comes up, goes through the initialize sequence, but then shows garbage on the LCD screen and no longer functions. Any idea how to reset it back like it was? Need to reset ink cartridge PG-510 for Canon Pixma MP250, where can I find software for this? thanks very much i want to make this software. Need software resetter cattrige canon mp160 full version. can somebody use this tool on mp 180 and save the bin file and upload it. im not able 2 get it i had accidentally erased it without saving. Is it working for MP282?? Is there another way to reset the ink level? Tool works well after reading post on putting in standby and not service mode, but only for ink levels not waste level they are not highlighted and marked as unkown. how to reset waste level to remove e5 error?? Pixma 160 E27 error: it is due to full ink waste absorber. Fine. I took printer apart, cleaned out that area and still get E27. How clear this error? Also, how get this fricking ink off fingers? Hola, no me funciona en windows 7 que puedo hacer…respondeme por favor ! Thanx for the instructions.Everything went well until…. Reset Black and reset Color. 99,98% must be O.K. then. But not, when I start up my Pixma MP460 everything is back to normal again, no reset anymore. Hi. Anybody can send me eeprom file from MP460?